I hope I win a free place on the course, as I can’t afford to pay for it right now, while I’m not working. Santou, I’ll be contacting you shortly to help you get set up for your free spot in Sweet Victory! For everyone else, there’s still time to sign up. What a story Santou shared! And the rest of your stories, too…. Wow. Just wow. Thank you so much to each and every one of you that responded to my Sweet Victory Giveaway. I wish I could give you all a free entry. I really do. Your stories of sugar’s hold on your lives touched me. But, since I can’t give you all a spot in the course, I can give you one of my stories, and a recipe. See, I’ve been doing this refined sugar-free thing for years. I’m fairly experienced at it. I think I know what I’m doing. But, you know what? Today I sugar-crashed. Yep. Full blown crash – shaking and sweating and light-headed. And, I knew exactly what was happening. Always eat fat and protein at every meal. Normally, this isn’t much of a struggle for me. I mean, come on. Fat tastes good, right? Protein usually comes in a pretty yummy package, too. So what happened today? Well, I packed a nice healthy smoothie for lunch – filled with fruit and greens and protein and good fats. And then I promptly forgot it in my backpack. So when lunch time rolled around, I went in search of something to fill my belly. I stepped out of my office door and into a beautiful, sunshine-filled 80° day. In March. In Wisconsin. These are rare. We relish them. So, I walked to the smoothie shop and got a fruit and veggie smoothie to enjoy while basking in all the glory of the day. Except there was no fat. And no protein. Two hours later, I hopped on my bike, rode home, dropped my bike, and walked to my son’s school to pick him up. And, that’s when I sugar-crashed. Ew. 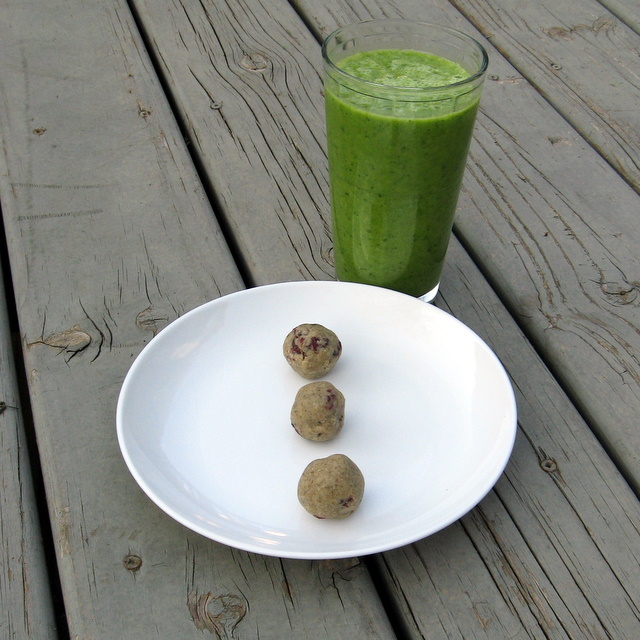 So, I came home, and after filling my face with some raisins (fast sugar) and nuts (trying to even things out with some fat and protein), I made some tasty little snack balls – the kind of thing I SHOULD have eaten with my smoothie to stave off the sugar crash. Now, I’ll warn you. These are not very sweet. But, they’re plenty sweet for me, a girl with a few years of this sugar-free thing under her belt. And, they’ll be plenty sweet for you, too – after you get through YOUR sugar detox. Place all ingredients except cherries in the bowl of a food processor. Process until mixture clumps together. Add cherries and pulse to dice and mix. Form into small balls. Refrigerate. *Yacon is a Central and South American tuber, with a pleasantly mild sweetness that comes mostly from inulin – a form of fiber. You’ll learn more about inulin and other complex sugars in the Sweet Victory course. This entry was posted in Blogger Community, cherries, desserts, grain-free, raw, snacks, vegan and tagged gluten-free, grain-free, recipes;raw, vegan. Bookmark the permalink. These look great, Deanna. And I’m glad you managed to reverse the crash! Congratulations to Santou! And I reiterate what Deanna said above: I was very touched by all of your stories, and I do wish we could give a free spot to everyone. Thank you all for sharing so openly about your own experiences. Love the cardamom and cherry combo! Great recipe, Deanna! You’re right.. once you get the sugar out of your system, it’s amazing how sweet natural things become! What a healthy snack! I’m looking for more things like this I can take to work instead of getting crackers from the vending machine at 3 in the afternoon (ugh). What is coconut butter? I cook with coconut oil and use coconut milk in curries all the time…what’s the difference, and where can I get it? Coconut butter is basically just like peanut butter or almond butter, but made with coconut. I give directions to make your own in this post: https://themommybowl.com/2011/01/03/coconut-butter-cookies-vegan-grain-free/. It’s really expensive to buy it in the store. But, as long as you can find unsweetened dried coconut and have a food processor or a high speed blender (Blendtec/Vitamix) it’s cheap and easy to make your own. I have a couple of other recipes on the blog that use it, and a recipe for a coconut, cashew, carob butter. Coconut is really good for me, so I use it a lot! Oh fantastic, thanks for the tip. I am definitely a coconut enthusiast, so will definitely try that.